This week I got the opportunity to explore Denver’s music scene for 5 days in a row of diverse music. Tuesday, I went down to see Hatcha and Ivy Lab throw down their sub frequency sounds for a sold out Black Box. It was popping as ever, with a 30-minute line out the door leading up to Hatcha’s 1030 pm set. His intricate sound design and heavy sounds really fit well with the Black Box. That UK Dub is always a pleasure. Ivy lab then came on for a great show, with his off-beat tracks and bass blasting. One of the more surprising faces in the crowd happened to be Jason Hann of String Cheese Incident. No, he wasn’t sitting in, but enjoying Ivy Lab as a fellow spectator. That’s just part of the random magic Denver seems to possess. Ivy Lab had people movin’ and groovin’ until 2am, when the venue turned the lights on for him. It was still so packed that he continued to play past 2am, until the sound board eventually shut the sound off on him. Marvelous set for yet another packed Tuesday night the Black Box. Ivy Lab throwing down at the Black Box. Photo courtesy of Brian Greenblatt of Dark Matter Photography for the Black Box. 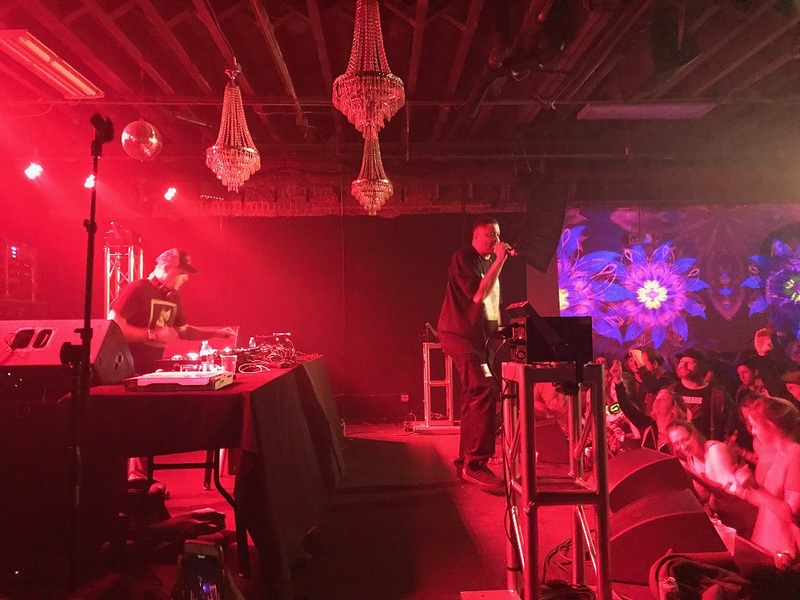 Wednesday, I got the opportunity to see Chali 2na of Jurassic 5 with Krafty Kuts, Chris Karns and The Party People for a good old school Hip-Hop show Cervantes The Other Side. The Party People started it off with their bumpin tracks, getting all the break dancers to the front and on the floor. Jubee and Benjamin both jumped in to the crowd for a face to face rap battle amongst their fans, which would only happen at an intimate venue like Cervantes The Other Side. During the intermission, Jubee came on with his goofball time killing and started a female rap battle. This turned into a great show as a woman went up who was clearly ready, and spit an acappella masterpiece. Chris Karns (2011 DMC DJ World Champion and part of Pretty Lights and Break Science Live Bands) followed them up with his break beats, old school hip hop and scratching sounds. Truly an amazing talent on the vinyl, he can even weave the beats with his hands behind his back. Following them, Chali 2na and Krafty Kuts put on a phenomenal show. Despite their age, they are still no joke and you should catch them when you get the chance. They have sick beats, good stage presence and that old school rap flow. Chali 2na played a lot of new tracks that he’s made with Krafty Kuts (they are coming out with an album soon), but also went back to his roots. 2na came out with some Jurassic 5 classics, ending with their most famous song “What’s Golden”. Chali’s flow is very unique and quick and really makes for a great show. Thursday, I got to see Action Bronson at The Ogden Theater. Trash Talk opened for him, with their screaming vocals, heavy guitar riffs and metal sounds. A mosh pit formed in front of the stage, and the lead singer even spit in to the stands. Action Bronson followed they up with an awesome show. He played old hits such as “Easy Rider” and “Acting Crazy”, and went in to his new Blue Chips 7000 album. He signed a bunch of his cookbooks F*ck That’s Delicious from the fans, and then proceeded to take a selfie video with a fans phone. Meyhem Lauren (who opened the show) was then brought out for their song “Mr. 2 Face”. It was a great performance from a large rapper/food fanatic. The weekend was for jamming starting with Everyone Orchestra at Cervantes Masterpiece Ballroom. Rastasaurus opened for them with an awesome performance, weaving reggae into trippy guitar riffs and amazing visuals. The light show for the night was stellar, especially for how small and intimate the venue is. Everyone Orchestra came on after a long intermission for an awesome folk, funk trippy jam. It was very entrancing and awesome to witness. This night featured Claude Coleman Jr. the drummer of Ween, Mike Rempel the guitarist from Lotus, Michael Travis drummer from The String Incident, Joel Cummins keyboardist from Umphrey’s McGee, Kevin Donohue Guitarist of Sunsquabi (filling in for Chuck Garvey of Moe. ), bassist Zdenek Gubb of Twiddle, trumpet of Euforquestra Matt Bricker, Turkuaz vocalist Shira Elias and baritone Sax/Vocals Josh Schwarts. The band was even equipped with a conductor who is the mastermind behind all of the Everyone Orchestra jam sessions. Matt Butler put on a spectacular show, jumping around, cueing different instruments, and using the crowd back and forth with the band as way of getting everyone involved. A notable special guest was D Vibes, who soloed on the keys a few times and really captivated everyone in the room. Rounding out the week of craziness were The Disco Biscuits who played a 2-night stint at The Fillmore Auditorium. Opening for them was Break Science, who started it off with a dance party. Heavy bass rhythms, awesome drum beats and mesmerizing keyboard riffs lulled the crowd in to a dance early on in the night. They played a few of their newest releases, as well as ‘Force of Nature’, high features an amazing vocalist, Paperwhite. Adam Deitch’s jazz background in drumming really flows well with Borahm’s synth and keyboard setup. They ended with one of their almost housy tunes, ‘Android Love’, a sure fire way to please all Break Science fans. The Disco Biscuits followed with a slow funky jam session. The visuals were enthralling, with lasers and lights shooting out every which way from the stage. The combo of the visuals and sounds truly put us in a trance. The pace switch-ups kept us on our toes during their long jams. The Fillmore is a huge venue, which really added to the night’s atmosphere. It was a great show and end to the week. Denver’s music scene is thriving with shows almost every night of the week! Be sure to check out these music venues and artists for future shows.